Dirk Longstreet (Gruner) truly has it all. A great job as a college track and field coach, a great first name, a great last name, and an overall vibe that tells the world, “I’m Dirk Longstreet”. Trouble arises when his younger brother Jeremy Longstreet (Morelle) begins attending illegal underground Punchfighting matches known as “The Circuit”. Deeply in debt to Circuit ringleader Vixton Hack (Genesse), who really gives Dirk Longstreet a run for his money in the awesome name sweepstakes, Hack tells Jeremy he can work off his debt by fighting in the ring. The problem is, Dirk was an undefeated champion of the Circuit in his past, but he walked away and started a new and better life for himself, and he wants to forget the old days. So even though he’s in top physical shape, he begins training with Circuit boss Lenny (Drago) so he can defeat current reigning champs the Kwan twins (Simon Kim and James Kim). Meanwhile, a typical female reporter, Nicole (Harris) has been tracking the Circuit and even gets close to Dirk on false pretenses. Her editor, Editor Bill (Merhi) (That’s how he’s credited) wants to pull her off the story, but her connections with cop Det. Sykes (Avedon) have her closer than ever to exposing The Circuit to the public. What in the world is going to happen? So many shirtless men punching each other, so little time. Fascinatingly, the main thing about The Circuit that would seem to anger most people, was, to us, one of its greatest strengths. That being the dialogue, which is written insipidly, delivered stupidly, and recorded unintelligibly. Half the time you’re yelling “WHAT? !” at the screen. When you get some dialogue spoken clearly, as ring announcer Bruce Buffer does (yes, Michael’s brother - ring announcing must be in the Buffer family DNA) we get such gems as: “a warrior for many years, the Ninja Warrior.” Hm. How inspiring. Another example is said by a random goon: “Dirk Longstreet’s in the house!” Maybe when Dirk Longstreet starts his rap career as MC Dirk Longstreet, he can sample that and put it on his album. He can always team up with Chino XL, who appears in the Circuit 2 (2002). Of course, there are the time-honored training sequences, shots of audiences screaming while clutching their cash, and the prerequisite barfight (s). But thanks to his past that he’s trying to escape, Dirk suffers from “punchdreams”, where he has nightmares of being punched. Truly that’s the next frontier of Punchfighting movies. A cross between Nightmare on Elm Street (1984) and Fist Fighter (1989). Producers out there, take notice. The Circuit doesn’t go that direction, of course, but viewers may suffer from Restless Legs Syndrome. It doesn’t help that the movie has these annoying, eye-singing flashes that unnecessarily appear between scenes. Unless Jalal Merhi has some sort of deal going with LensCrafters to surreptitiously drive business their way from eyeball-damaged Punchfighting fans, there’s no need for this. Speaking of Merhi, he has a sit-down role (as he does in The Circuit 2) as Editor Bill. Thankfully, when his parents named him, they knew he would be a newspaper editor. That was fortuitous. Kind of like how fish grow to fit the bowl, or subconsciously, people come to fit their name, like Jay Woelfel, the director of the horrendously awful Iron Thunder (1998), which is indeed woeful (as we pointed out in our review). Thankfully, Merhi doesn’t do much (though even what he does do is unlikable), and neither does his buddy Loren Avedon. Apparently these two guys are so hard to work with, they can only work with each other. They’ve been exiled to the outer reaches of DTV slop, as has Bryan Genesse, who here resembles a card-carrying member of the Trenchcoat Mafia. A general rule of thumb is, if Genesse is involved, you’ve hit rock bottom. 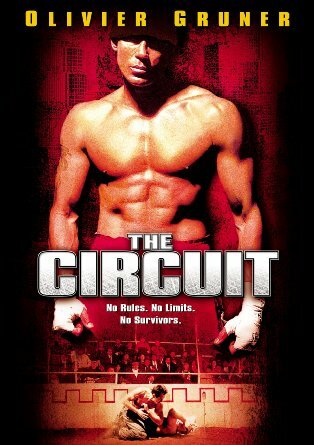 Fan favorite Billy Drago is...here...and Michael Blanks plays a guy named- wait for it - LL Cool J! Isn’t that against copyright law? How are they able to get away with that? Regardless, his name in the movie is LL Cool J. Clearly the writers of this movie were doin’ it, and doin’ it, and doin’ it, but not so well. No one alive knows why, but there are THREE The Circuit movies. Now we just need to track down the hard-to-find third entry. For the sillier and less-substantial end of the Punchfighting genre, there’s always The Circuit. All three Circuit films are available in an Australian DVD release called the Circuit Complete Collection. Do you own this collection? This was one of the best Gruners. What a cast! Part III is still MIA from my collection. Does anyone actually own it? Ty, I have that collection. I've only ever seen it twice in my life! Roger: Gruner was decent in this. Mercenary is one of his best. Posting Friday. Explosive Action: Haha! That's great you have it. How was the 3rd one?